This recipe is the real deal! I have spent a long time trying to get a pizza crust just like they have at pizza places, and I finally did it! Don’t get me wrong, I enjoy a homemade-tasting pizza crust that can be thrown together quickly (like my Quick & Easy Pizza Dough), but I wanted an exact replica of a pizzeria crust, and I knew that they were not punching down and kneading hundreds of dough balls every day! My breakthrough came when I watched a You Tube video below from a New York pizzeria (I cannot find the video anymore for the life of me!). I scaled down his recipe to make 2 pizzas instead of 50 and it worked! This is it, the real deal! Flavor, crunch and chew just like pizza from your neighborhood pizza place! 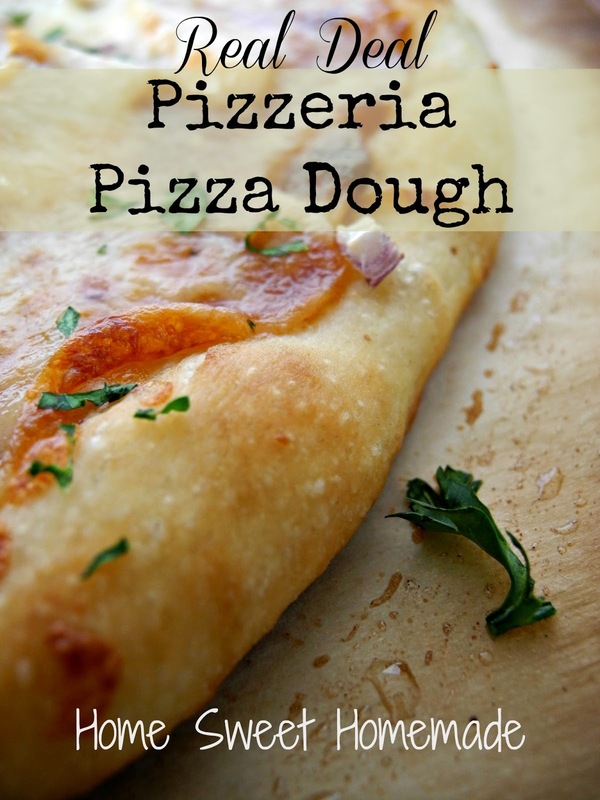 This is a make-ahead recipe; you will need to make the dough 1-3 days before you need it. This will make 2 pizzas. 1. Mix flour, salt, sugar, and yeast in the bowl of a stand mixer. Add water and mix until the flour is incorporated. Knead with the dough hook on low speed for 5 minutes. 2. Add oil and knead for an additional 5 minutes. 3. Place dough on countertop; allow to rest for 10 minutes. 4. Divide dough in half; shape each half into a smooth ball. Place each dough ball into a greased container or bowl and cover. Refrigerate overnight or up to 3 days. 1. Place pizza stone in oven, if using. Heat oven to 550°. While oven is preheating, flatten and stretch each dough ball into a 12 to 14-inch circle, depending on desired thickness (or how big your pan is, if using one). 3. Build your pizza either on the parchment-lined pan you will cook in, or the parchment-lined pan or peel you will use to transfer it to the stone. Add desired sauce, cheese and toppings. Follow me on Google+ and never miss a homemade recipe! Let me know how it turns out Ashley! Thanks for stopping by! really only 4-6 min in the oven! can't wait... I've tried a few homemade pizza crust recipes and never been very impressed with myself... but I'm giving it another shot... tomato basil is the goal! My hubby is on a low sodium diet and homemade meals (vs processed) is the easiest way to control the salt intake... but I'm running out of ideas for dinner! I am so excited for you to try this recipe Haley! I love the results every time! Let me know how it works out for you! Looks awesome. Are you using instant yeast or active dry? If active dry does it not have to be proofed first? Can't wait to try it out! I have used both; you can use either and there is no need to do any thing different. It says you need to do this ahead but the recipe appears to be fast. What is it I am missing? You have to make the dough in advance and let it sit in the fridge at least overnight. After that it is very fast!